Ade and I had been discussing about the Myer Briggs Type Indicator for weeks now. 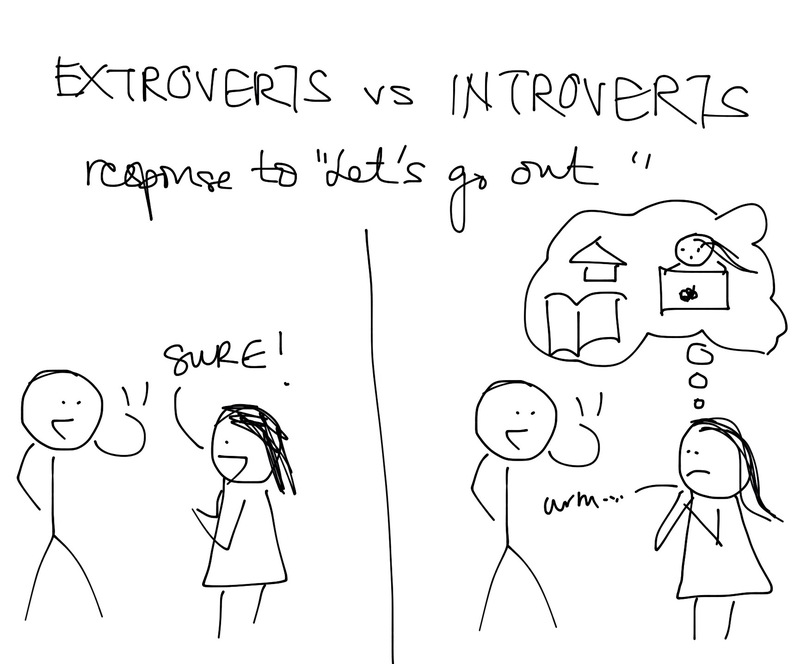 Our favourite sub-topic is Introversion vs Extroversion. Being polar opposite, we find it so amusing how we react and think differently at a similar situation. Introverts are a misunderstood bunch. Firstly introverts are generally not necessarily socially awkward. In fact, they can be charismatic. Martin Luther King who gave one of the most famous speech in history is an introvert. Introverts recharge by being alone. Extroverts gain energy by being with people. I’m often mistaken as being an extrovert; I love to meeting people and, I talk a lot and I love traveling. I have a lot of friends and a lot of parties to attend. I enjoy all that. But after all that I need time alone to think and relax. A lot of it. Oh, sometimes I wish I can explain that my delayed response to a call to go out is due to my introverted nature. All introverts need is a just little nudge. Okay, maybe a big nudge. Which is why we are so drawn to extroverts; they are the only people who are willing to pry and discover the many thoughts we store in our head from endless reading and reflections.